GAME 1: Reveal 3 IDENTICAL amounts, WIN that amount. Reveal 2 IDENTICAL amounts and a symbol, WIN DOUBLE that amount. GAME 2: Reveal 3 s or 3 s in the same vertical, horizontal or diagonal line, WIN prize shown. GAME 3: Reveal 2 symbols, WIN the prize shown. 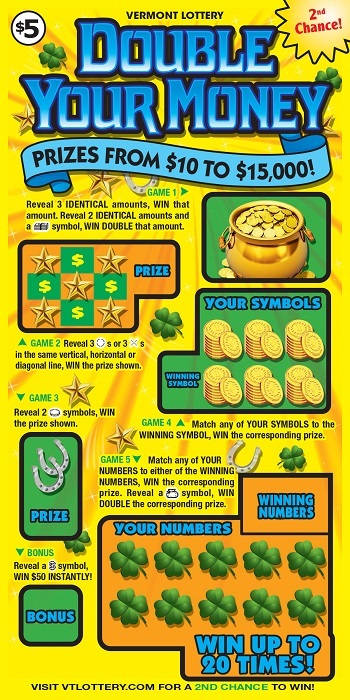 GAME 4: Match any of YOUR SYMBOLS to the WINNING SYMBOL, WIN the corresponding prize. GAME 5: Match any of YOUR NUMBERS to either of the WINNING NUMBERS, WIN the corresponding prize. Reveal a symbol, WIN DOUBLE the corresponding prize. BONUS: Reveal a symbol, WIN $50 INSTANTLY! 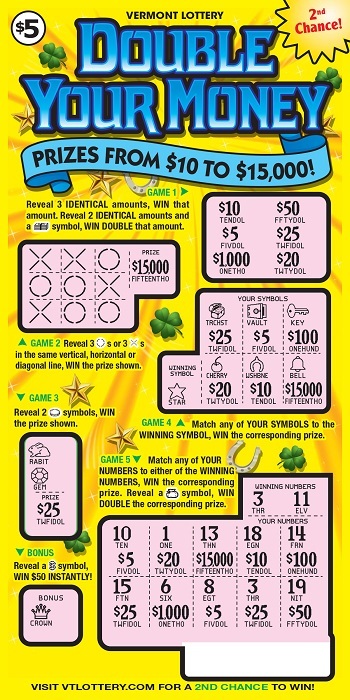 Enter your non-winning DOUBLE YOUR MONEY tickets into the Vermont Lottery’s 2nd Chance Top Prize and Quarterly drawings. Click here to enter tickets or to become a member of our 2nd Chance Club. Stay up to date by visiting the 2nd Chance site often, checking on draw dates, times, and scanning the winner’s page to see if you’ve won a prize.